John Runions is a little bit like Dr Jekyll and Mr Hyde – only that his two identities both have a Dr title. Most of his time he spends working, teaching and playing with the microscopes at Oxford Brookes University. But when nobody is watching, he puts on his cape of knowledge, takes his sword of science enthusiasm and leaps on air as “Dr Molecule” for BBC Radio Oxford. 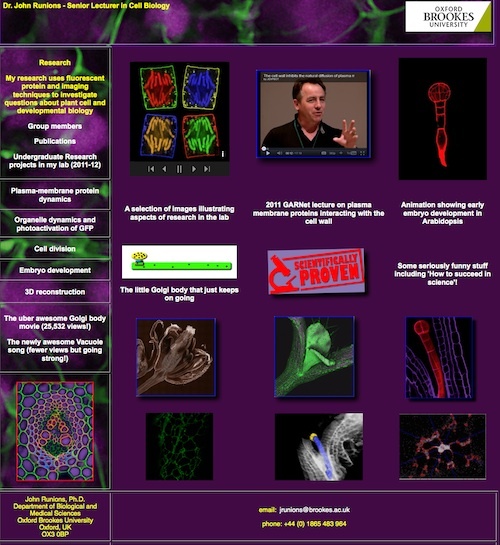 John’s website is like a little treasure chest, full with microscopy images and movies. You can even watch one of his presentations from the last GARNet meeting 2011 on YouTube and learn more about his research on plasma membrane proteins. Plant cells are composed of many interacting compartments and I am fascinated by the interplay between molecules that allow cells to grow and divide, organise into tissues, and ultimately form the entire plant body. 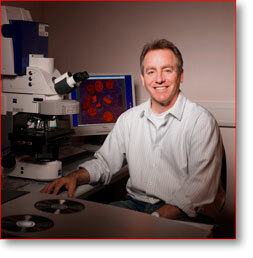 Specifically, my research uses high-tech microscopes to look at proteins in the membranes of living cells. 2) What are the best and worst things about your work? Best, that’s easy. Being able to look at life’s processes using equipment and technology that hasn’t existed before which means that my colleagues and I are seeing things that no one has seen before. Worst, hmmm… Perhaps it’s just the continuing task of finding funding to do the research in the first place. In the end, if one doesn’t do the worst bits there is no opportunity to do the better and best ones either. Two things conspired. I have always loved nature and had urges to study biology but didn’t know what aspect and, in fact, I favoured the idea of studying fish. As an undergraduate in university I was so impressed with one of my Professors that I took a summer research job in her lab that mostly involved doing the washing up (I’m not joking). She worked on plant biology and I have never looked back. My small project in her lab was to look at the roots of courgettes (zucchini). Since then I have studied tree reproduction, flower evolution, embryo development, and cell and membrane biology. 4) What do you do to get your mind off of work? Gardening, photography and birdwatching are my hobbies. I like to watch Big Bang Theory on TV but that hardly takes my mind off work (what a bunch of geeks!). Studying biology can lead to a very rewarding career. Be sure though that you have a love of whatever subject you study or plan to study (yes, even maths). Science need not be a scary subject and you will find that it is possible to learn it if you apply yourself a bit. The ‘I can’t do it, it’s too hard’ attitude really won’t work for you as you go through life. Plus if you study the stuff that I work on you get to play with lasers! John’s talk at the GARNet meeting 2011.